FILE - A woman mourns before a memorial to those killed in violence in Kyiv, Feb. 25, 2014 — the day that parliament voted to send fugitive President Viktor Yanukovich to be tried by the International Criminal Court for "serious crimes." Ukraine granted wider jurisdiction to the International Criminal Court on Tuesday that will enable ICC prosecutors to investigate possible war crimes committed during Russia's annexation of Crimea and the separatist conflict in eastern Ukraine. Ukraine had earlier accepted the court's jurisdiction for a limited period from November 2013 to February 2014, when pro-Russian President Viktor Yanukovich attempted to crush mass protests, with heavy loss of life, before falling from power. The court said Tuesday that Ukraine had now expanded its jurisdiction to include the period up to the present. Russia annexed Crimea in March 2014, and fighting broke out in eastern Ukraine the following month between pro-Russian rebels and Ukrainian government forces. The U.N. Human Rights Office said Tuesday that at least 7,962 people have been killed and 17,811 wounded in eastern Ukraine since mid-April 2014. "Ukraine will cooperate with the court without delay or exception," the ICC said in a statement. Prosecutors at the court in The Hague have launched a preliminary investigation in Ukraine and, based on the findings, will decide whether to start a formal war crimes probe. "If an investigation is opened, it will also be for the ICC prosecutor to decide, on the basis of the evidence collected, whether to ask the ICC judges to issue arrest warrants," the court said. The expanded probe could for the first time consider allegations by Ukraine and Western governments of direct Russian involvement in the conflict, something Moscow denies. 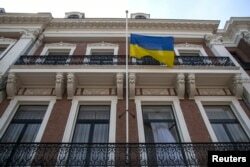 FILE - The Ukrainian national flag flies at half-staff at the Ukrainian Embassy in The Hague after the loss of a Malaysia Airlines plane over rebel-held territory in eastern Ukraine, July 18, 2014. It is unlikely, however, that the ICC will investigate the shooting down of a Malaysia Airlines passenger plane over rebel-held territory in eastern Ukraine in July 2014. The Netherlands, which is leading an international investigation into the deaths of the 298 passengers and crew, most of them Dutch, has said it prefers that a U.N. tribunal, or a national court, try those responsible. The ICC is a court of last resort, which intervenes only when national authorities are considered unwilling or unable to prosecute.